Lumbar Facet Mediated Pain is caused by the lumbar facet joints. 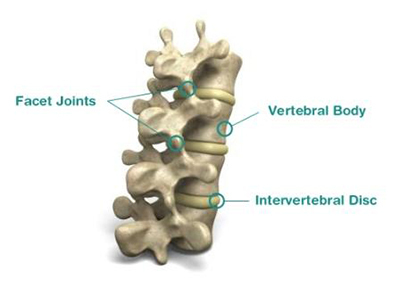 The lumbar facet joints are also known as the zygapophyseal joints, stabilizing the posterior column of the spine. These joints come in a pair at each level. They are formed by the inferior articular process of the upper vertebrae and the superior articular process of the lower vertebrae. The nerve that supplies the sensation to this joint is called the medial branch of the dorsal rami. The medial branch is encapsulated nerve endings, which provide sensory input from the facet joints. It is estimated that the facet joint contributes to about 30% of the cases of chronic low back pain. As mentioned, the facet joint contributes to about 30% of the cases of chronic low back pain. In my personal experience, it is the most overlooked part of the spine, whereas patients have been treated for many years for low back pain, the diagnosis of facet-mediated pain has never been considered, and they have had no treatment for facet-mediated pain. In these cases when the appropriate Lumbar Facet Mediated Pain treatment is instituted, patients may get great relief from those treatments. Facet-mediated pain is also more common in the older population. In terms of radiographic examination, there are no specific signs for facet-mediated pain to look for. Nonspecific signs on diagnostic studies, including an MRI, could include facet arthrosis, osteophyte, and even hypertrophy of ligamentum flavum. In terms of diagnostic studies, an x-ray of the spine or a CT scan usually will suffice. A detailed MRI is not usually needed to make a diagnosis of lumbar facet-mediated pain. More important than imaging is the history and the physical examination for the diagnosis of facet-mediated pain. Conservative treatment is the first recommended treatment option for most cases of lumbar facet mediated pain. -the goal is to avoid aggravation of the injured lumbar facet pain. – avoid activities e.g. sporting activities that cause excessive extension or twisting of the spine (e.g. basketball, tennis, soccer). The pain, however, is more common in the less active older population. To schedule an appointment to be seen by Dr.Kalia please contact us today to get started. Obtain for you Lumbar Facet Mediated Pain quickly.